Darnell Nurse was emotional following his first training camp with the Oilers. Shortly after the team’s pre-season game against the Rangers on September 24, 2013 at Rexall Place, Nurse was among four players assigned to either the American Hockey League or, in Nurse’s case, juniors. Flash forward a year to today and the Oilers have wrapped up their pre-season schedule and Nurse remains with the team. The seventh-overall pick in the 2013 draft has been given an opportunity. It’s a chance to stay another day, a chance to play some NHL hockey and perhaps it's an opportunity to prove he’s ready to stay on full-time. The Oilers have the time to see where it goes. The club has a nine-game window, while Nurse still has junior eligibility, before they must either keep him in the NHL or assign him to Sault Ste. Marie. If they return him to the OHL after playing more than nine games, he would only have two years left on his entry level contract, versus three. Whether or not Nurse sticks is up to him. “He understands that the evaluation of him continues,” Head Coach Dallas Eakins said. “I thought about this before when we were going to talk to him, I was thinking if we should bring up the whole nine-game thing to him. Number one, he already knows. He understands that the evaluation for him will continue, but it does for everyone. Nurse was hesitant to celebrate his being in Edmonton and being here to play another day. The team's nine-game window looms over the 19-year-old defenceman, a constant reminder that he’s being watched and evaluated. Nurse earned this opportunity. He showed enough in his work ethic and development, dating back to Orientation Camp in Jasper to Oilers Rookie Camp and then on to main camp and pre-season, to deserve more of a look with the Oilers. “For me, it looks like he’s ready and deserving of this opportunity, that’s the simple answer. 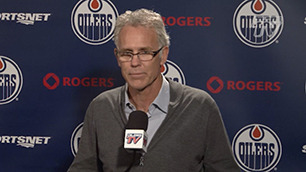 In a lot of ways, I think he outplayed the guys that he was up against,” MacTavish said. 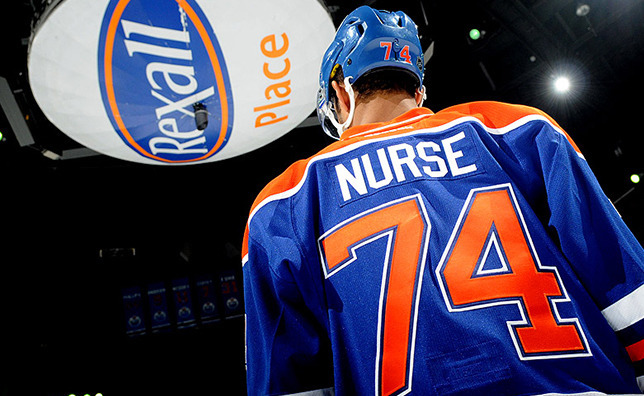 Nurse earned more time with the Oilers against a raised level of competition as well. The organization brought in veteran defencemen Nikita Nikitin, Mark Fayne and Keith Aulie in the off-season. Young defencemen like Oscar Klefbom and Martin Marincin have already gained NHL experience last season. Nurse came in and competed with them all. Nurse is happy to still be around, but don’t make the mistake of assuming he’s content with just that.